This superb effort from UA only loses out on top marks due to its clunky GUI, but sonically, it goes hall the way to ten! Fantastic classic reverb. The other efects are great too. Do-it-yourself manual phaser! Simple parameter set. A 'modern' GUI would be nice. Background hiss – just like the original! German plate reverb meisters EMT unveiled the world's first digital reverb device, the EMT 250 Electronic Reverberator, way back in 1976. This mighty chunk of hardware had 16KB of RAM, now-comical control levers to set parameters, three fans and a huge heatsink. As well as reverb, it offered digital delay, echo, chorus, phaser and 'Space' effects. The input was mono but the unit gave out four channels, for quadraphonic effects (quad audio was thought to be 'the next big thing' at the time). Incredibly, the EMT250 is still held in extremely high regard by many world-class producers. But with only 250 ever made and prices now reaching around $10,000, you'll need to rack up a few gold records of your own before you can afford one. 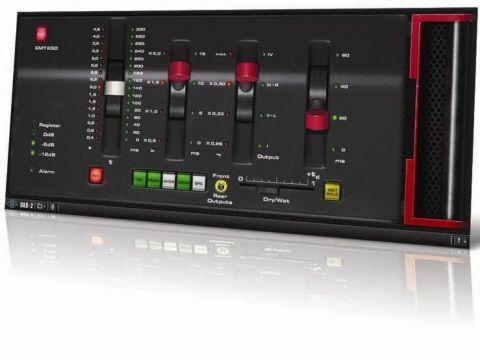 All is not lost, though, as Universal Audio has created an official plug-in emulation of the EMT 250 for its UAD-2 DSP platform. It even uses the original's algorithm, implemented with assistance from its designer, Dr Barry Blesser. UA has stuck very closely to the original design, and this extends to the interface, with its four levers controlling the parameters of the currently selected effect (you can only use one effect type at once). It might be novel, but it's a waste of screen space and hardly intuitive, either. An alternate compact GUI with 'normal' controls would be very welcome. It's a warts-and-all reproduction, then, with the old school, character-building AD/DA stages modelled too, complete with soft background hiss and inputs that clip if pushed too hard - heed the metering lamps! Unlike the original, there's a Front/Rear switch to select a stereo pair from the quad output, and a Dry/Wet slider (the dry signal bypasses the virtual AD/DA stages). Switches select the active effect, and the stereo Delay mode gives up to 375ms delay per side. The mono Echo, meanwhile, has adjustable predelay, delay time and HF damping, while Space is basically a really long reverb. The EMT 250's Chorus and Phaser modes are not to be ignored. The first of these has four preset chorus types and control over predelay time. We liked the subtle Mode II best, which is capable of a convincing double-tracked stereo effect, a little like the Cooper Time Cube plug-in (also for UAD-2). "When mixing, the EMT 250 provides a most pleasing 'cushion' of reverb, almost as though it's enveloping, supporting and enhancing source sounds." sometimes bend sounds out of tune. The Phaser program is even simpler: the fourth lever controls predelay, while the first manipulates phase, and the Front/Rear switch changes the phasing 'flavour'. There's no LFO, though, so you'll have to use automation of the handle to get it moving! This is actually a pretty cool feature, and the phaser is also useful in the static position - eg, for softening up overly sharp percussion or shifting the timbre of instruments. The main Reverb's parameters are decay (0.4s to 4.5s), bass and treble damping (four options each), and predelay (0/20/40/60ms). The sound is very lush, with some pleasant modulation going on and a dark tonality. There are no in-your-face early reflections as such - it's almost like a plate reverb in this sense. When mixing, the EMT 250 provides a most pleasing 'cushion' of reverb, almost as though it's enveloping, supporting and enhancing source sounds, rather than getting in their way. It's easy to mix with and sounds 'right' on a variety of material - we tried it on drums, percussion, vocals, synths and guitars. It won't necessarily make your other reverbs redundant, though, as it only really has one sound. But what a fabulous sound it is. It has a 'magic' to it that few others can touch, and when you factor in the EMT 250's five funky extra effects, it all adds up to one outstanding plug-in.